Ofcom is consulting over a revised Digital Radio Technical Code, which could pave the way for DAB+ to be implemented in the UK. The proposed new Digital 2 multiplex could contain a mix of original DAB and DAB+ services. Real XS has been replaced by XFM in Scotland. XFM went live on Monday 7th April after a transitional period over the preceding weekend, when the new XFM playlist was introduced. XFM is available on DAB in Ayr and Central Scotland and in the Glasgow/Paisley area on FM. The station switch is part of the wider changes to the UK's commercial radio industry after the merger of XFM owner Global Radio and Real & Smooth Radio and subsequent sale of some stations to Irish Communicorp. Real XS continues to be operated by Communicorp in the Manchester area for the time being. XFM was originally broadcast in Scotland on the frequencies now used for Capital FM (Scotland) until 2008. In a related matter, listeners in North Wales will need to retune soon in order to keep listening to the Heart network as a result of changes to ownership of the main commercial radio stations in the north of the Principality. The change means Heart will be available to more listeners in North and Mid-Wales. 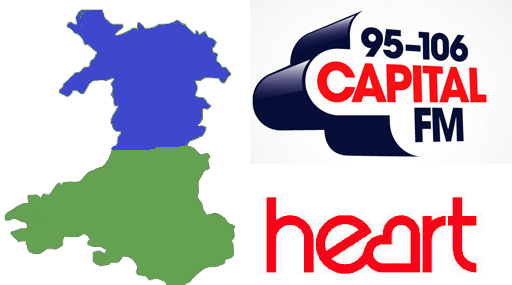 The frequencies currently being used by Global Radio's Heart are transferring to Capital FM. Heart meanwhile takes over the Real Radio Wales frequencies and will be operated under licence from Global Radio by Ireland's Communicorp, because of competition concerns. Both stations will broadcast programmes for North Wales, for the current Real Radio service this means an end to programmes targeting the whole of Wales. On DAB in North East Wales, Real will become Heart. Currently the local version of Heart isn't available in the are on DAB. There's been no news if Capital North Wales will join the local line-up. There are currently no local DAB transmissions in the rest of North Wales. From transmission to presentation - details of who will be presenting which shows during local hours on Heart and Capital North Wales have yet to be announced. The changeover is due to take place in early May. The BBC and commercial digital radio operators are in the process of increasing DAB digital radio coverage between now and the end of next year. Recently, it's gone quiet, with the BBC not announcing any new additions to its DAB network in the last month - it's due to add over 150 more DAB transmitters before the end of next year. There's also been no further news over the fate of the Derbyshire local DAB multiplex. Earlier this year, Arqiva hinted that they were working on an April launch. And there's no new launch timescales for any of the other new local DAB multiplexes that listeners are waiting for just yet. BBC Radio 4 LW is subject to daily shutdowns until the summer, and BBC Radio 5 Live on 693 kHz in central England and mid Wales is subject to reduced power. BBC Radio 4 LW continues as normal from Scottish LW transmitter sites at Westerglen and Burghead. The BBC Reception website statement has been revised with the following: "From Saturday 29th March until June/July, 2014 the BBC Radio 4 LW Droitwich transmitter will be subject to daily shutdowns between 10:00-17:30hrs. We are undertaking required maintenance on the two 700ft masts that support the Radio 4 LW antenna. This involves inspecting and then painting the masts and greasing the stays that support them. We need to do this level of maintenance about every 10 years. We are also taking the opportunity to undertake some upgrades to the transmitter itself." The concern was that interference from Suffolk based DAB would cause interference to other users in Holland and Belgium. It was to allow time for these services to be re-allocated new frequencies. Good news - the introduction of DAB+ is the only hope for DAB in this country.